The Delta Sky Club in Terminal 2 at LAX offered everything I needed for a productive visit prior to my flight. If I’m using a lounge in the morning, the three most important amenities I am looking for are coffee, internet, and breakfast. In terms of those criteria, the Delta lounge not only met my expectations, but exceeded them. Internet was fast and never faltered. My cappuccino was dispensed by a Swiss-made Thermoplan machine (the best of all coffee machines in my opinion) and the Starbucks coffee itself was also acceptable. The buffet breakfast spread was exceptional, including fresh strawberries and a lovely peusdo huevos rancheros offering. Other items in the buffet included hardboiled eggs, yogurt, cereals, and salad. The lounge never got very crowded during my stay, with most people clustered around the buffet and drink stations. A whole wing of the lounge was literally empty. The lounge is located on the upper level (technically level 4) of Terminal 2 departures. Like most Delta Sky Clubs, I would rate this an an above-average lounge in the USA. I particularly enjoyed the breakfast, but was thankful for a quiet place to sit and be productive for a couple hours prior to my flight to Mexico City. How did you get in, in the end? Figured we’d get the answer in the review! This is somewhat random but I rarely fly Delta but I vividly remember a wonderful Delta lounge that had a fireplace (gas) and really swanky homey feel to it. This was a couple of years ago but is there such a thing? Did I imagine it? 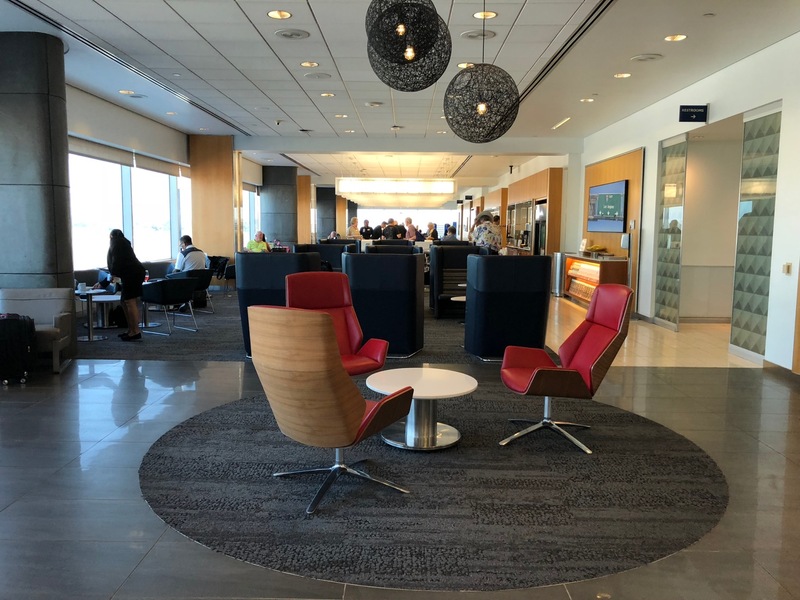 It was such a lovely change from the usual lounge I was impressed and even briefly considered ditching my 1K on United to aim for status on Delta. DTW and MSP both have clubs with fireplaces. HOW DID YOU GET IN???????? I’m disappointed with the new SkyClub. In the old LAX terminal, it seemed much larger (or at least less claustrophobic). The crowds the last couple times in the new terminal have been so thick that I no longer look forward to going. Have you visited the club in T3? Nope, so I appreciate the reminder…will give it a look. Thanks! The only thing that most of us were anxiously waiting to find out was how you got. That sentence you wrote in the comment section is so underwhelming. Such a non-story. Disappointed. I’m a Delta flyer. In all my travels over the last 10 years I’ve had 6 segments not on a Delta/Skyteam airline. I like most of the lounges and love a couple, but what I really, really, really appreciate is the staff that work in the Sky Clubs. Without exception everyone from the agents to the people cleaning up the plates are friendly, helpful, and hard-working. I wish they had known the rules instead of blocking me from entrance. The staff was hardly friendly at LAX after I refused to back down from their access denial.